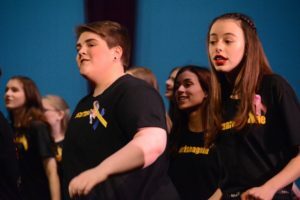 Broadway Night Needs Your Support Now – Spread the Word! Please come out and support Chorus and Broadway Night! Show Your Support with One-Liners & Ads! Purchase BWN Shout-outs one-liner for your performer that will be printed in the BWN program. Deadline is January 22nd so do it today! Do you know of a business that may be interested in supporting Broadway Night with a program ad? Or would you be interested in supporting your performer with ¼-page Ad? Learn more about BWN ads here: BWN Program-ads Deadlines has been extended to no later than Tuesday 1/22 for paid ad and content. The next order for physical gift cards and check orders will be placed at noon on 1/25. It is also the earnings cutoff for the NY trip. Subsequent earnings will go towards future trips. The 2nd Payment was due this past Friday, 1/11. If you have not done so, we need your payment ASAP. Please pay via My School Bucks (preferred method) or send in a check to Mrs. Gigliotti/Mrs. McCormick with “chorus spring trip” on the memo line. Please make sure to check the Rehearsal Schedule, which is also posted on Remind! Some HS students didn’t realize that there were changes this week, so please review it! COSTUMES –See the current costume document with the latest information regarding costumes. Absence Form: Please continue to use the Absence Form, and remember unless a performer is ill, we need everyone to commit to rehearsal times especially once tech week starts on Friday, January 25th. Restaurant Night at Silver Diner is tomorrow, Tuesday, 1/22 from 5-9pm! Come out and support the show! Share it with others! Flyer here! Buy your Tickets to the Show – Buy your tickets now! Certain shows could sell out, so don’t wait! Check in with your friends, family and neighbors now! Performer Ads/Shout-Out One-Liners: Tomorrow, 1/22 is the last day to buy program ads or shout out one-liners for your performers! Click and purchase at the bottom of the BWN page on the website! Business Ads: Do you own a local business? Work for a company that would be willing to support BWN? Ads are due by tomorrow! BWN Text Alerts! Please sign up for Remind, to receive BWN text reminders and updates. A snapshot of the schedule for the day will be posted everyday there is rehearsal! NOTE: For Verizon Wireless customers: As of 1/28, if you do not have the Remind application downloaded on your phone, the text alert function will no longer work. Make sure to download the app and ensure the push notification is set! Join @bwnrocks. Managing weather! ‘Tis the season of the polar vortex so in the case that FCPS closes, we have secured possible alternative rehearsal spaces if the roads are safe for travel. In the case of inclement weather & school closings, the current backup date for the show is Sunday, February 3rd Time TBD.